Are you looking for great places to go fishing? Or are you an avid angler who wants some inside information? Check out the various fishing-related maps available online to help in your angling adventures! 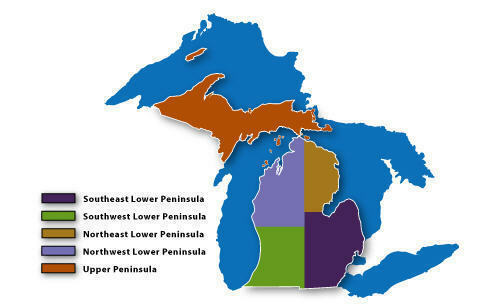 Inland Lake Maps: There are more than 11,000 lakes in Michigan – and the DNR has maps for 2,700 of them! These maps can help with inland lake fishing efforts and highlight shore features, vegetation and other water body specifics. Inland Trout and Salmon Regulations Maps: These maps assist anglers in locating waters that contain trout and salmon and the regulations that apply to those waters. The fall steelhead run always starts about the same time the salmon run is winding down. The fish are starting to show up in bigger numbers. The inland lakes are doing fair to good for bluegill, crappie and perch. Try minnows or crawlers along the drop offs. Click on the links below to jump to the report section that interests you most. Lake Erie: Perch seem to be holding in waters 24 to 26 feet deep southeast of Stoney Point. A few walleye were caught between the beach at Sterling State Park and the mouth of the River Raisin. Crank baits worked best. Water temperatures are dropping at a good rate so catch rates should continue to improve. Detroit River: Is producing smallmouth bass, a few walleye, and the occasional muskie. For perch, try the Cross-Dike, the south end of Grosse Ile or around Celeron Island with minnows or crawlers. Lake St. Clair: Smallmouth bass fishing has slowed as anglers struggle to find them. Cooling water temperatures should bring the fish back into shallower waters. Muskie anglers have done well which is typical for fall fishing. Yellow perch fishing was spotty but fish were caught near the Dumping Grounds, Grosse Point Yacht Club and the shipping channel. St. Clair River: Walleye fishing has been very good at Port Huron. Anglers are jigging or wire line trolling. Walleye fishing was good in the lower river and the channels near Algonac. Lexington: Those fishing off the breakwalls and the docks have caught the occasional chinook, steelhead or brown trout. There are a lot of emerald shiners in the harbor. Port Sanilac: Is also producing trout and salmon for those shore and pier fishing. A few pike were also caught. Harbor Beach: Those fishing at night have caught walleye off the north wall between 1 AM and 5 AM. Only a few brown trout were caught in the Edison Channel. Saginaw Bay: When they can get out, boat anglers reported decent catches of perch in 20 feet off Gambil's Marina which is up near Pinconning, near Buoy 22 along the shipping channel, or northeast of Spoils Island which is the large island straight off the mouth of the Saginaw River. The bite is best from dawn until about 10:30AM. At Quanicassee, a few were caught but most boats had to stay in the river. At Sebewaing, a few guys fishing from the docks in the marina caught bluegills and a few crappie. The boats are gone so the docks at Bay Shore Marina, near Bay Port and the docks in the Caseville City Harbor are now open to shore anglers. Dredging continues in the channel at Caseville. Saginaw River: Had nothing going on in the lower river. St. Joseph: Salmon are still being caught out in 120 feet. Pier anglers have caught a fair number of steelhead. St. Joseph River: A few salmon are moving through the ladder but the fish are dark. The steelhead run has been slow. It could take a cold rain to get the fish moving because they prefer water temperatures between the upper 40's or low 50's. South Haven: Boat anglers are still taking salmon in waters 100 feet deep. Pier fishing was slow but they are getting the occasional steelhead. Kalamazoo River: The salmon action is pretty much done but anglers are catching steelhead and brown trout up near the Allegan Dam. Holland: Boat anglers caught steelhead in 80 to 140 feet. Downriggers were set 70 to 120 feet down. Fish were hitting on magnum spoons with a silver back. Grand Haven: Fishing was slow. No boats were out but pier anglers managed to take a couple steelhead when fishing spawn before daylight. Grand River at Grand Rapids: Anglers should find steelhead and the occasional brown trout up near the Sixth Street Dam. Try spawn bags, a jig and wax worm or small spoons such as Cleo's. Muskegon River: Anglers are still catching the occasional salmon. Steelhead are in the river and eating the abundance of salmon eggs. Try drifting fresh spawn, fish egg patterns or a jig and wax worm. Whitehall: Pier anglers are catching steelhead on spawn but they are putting in some time to get a few fish. Rogers City: Boat fishing has almost come to a stand-still. The marina, the restrooms and the fish cleaning station are now closed for the season. Dredging is still scheduled for this fall. Those fishing off the wall caught a couple salmon but the fish are dark. A fair number of brown trout are in the marina and were caught by those casting spoons and body baits or floating spawn. Presque Isle: All the boats are gone. The marina and restrooms are closed. Thunder Bay River: The salmon are actively spawning and turning very dark. Anglers will not find few fresh fish at this point. Not many steelhead yet. Harrisville: Anglers are still catching a few salmon on spawn, spoons and body baits. Fish have been caught day and night as times vary when the fish are moving into the harbor. Oscoda: Pier anglers have caught some walleye on spoons or body baits. Au Sable River: Most of the salmon seem to be up at the dam but a few stragglers are still coming in. Many are turning dark and are spawned out. The good news is fresh steelhead are now moving into the river and those floating spawn or flies are catching fish. Tawas: Pier fishing was slow. A large number of emerald shiners are moving into the harbor and small perch ranging 4 to 7 inches are following them. A couple boats were trolling near the mouth of the river. Tawas River: Is still producing a chinook salmon here and there but the run is definitely past the peak. Au Gres: Boat anglers caught perch in 20 to 35 feet of water straight off the river or up near the Gravelly Shoal which is between Pt. Au Gres and the Charity Islands. Au Gres River: Salmon and steelhead fishing has been hit-or-miss down near the Singing Bridge. Steelhead are just starting to show up. Petoskey: Dredging in the marina is done and most likely the docks will remain out of the water until next season. Pier fishing was slow. A couple chinook or steelhead were caught on spawn bags near the mouth of the river. Most are now waiting for the steelhead run to get started. Bear River: Still has the occasional chinook up near the dam or downstream. Fish were caught between the bridges below the dam. Try spawn or yarn. A couple coho and steelhead were caught on spawn near the dam. Charlevoix: Smallmouth bass fishing slowed but a few largemouth bass were caught on crawlers, minnows, and scented rubber baits. Those fishing near Medusa Creek reported no fish caught. Traverse City: Those fishing the East Bay caught cisco and the occasional whitefish when jigging in 80 to 130 feet. Smallmouth bass can be found in 10 to 30 feet and a few perch were caught on live bait in 30 feet. Very few boats were out on the West Bay. Look for perch and bass in 20 to 35 feet. Elk River: Steelhead, coho, and a few lake trout were caught on spawn bags near the dam but catch rates were slow. Boardman River: Anglers caught a couple steelhead on spawn, jigs or trout beads. Lake trout are hitting on spawn bags. The salmon are in bad shape. Platte Bay: Those surfcasting with spawn have caught steelhead near the mouth. Frankfort: Steelhead anglers were landing some very nice fish. They were using fresh spawn or gold and orange wobblers. Pier anglers caught some nice fish including a 13 pound coho. Portage Lake: The boat launch in town is closed for dredging this week but the DNR site at the west end is still open. With the wind and rain, anglers were not having any luck for bass or panfish. Lake Cadillac: Is producing a few walleye, bass and pike. Manistee: Pier anglers and those surfcasting have caught salmon and steelhead. Most are using spawn. Manistee River: Is producing steelhead all the way up to Tippy Dam. Chinook can still be found up near the dam however the fish are in bad shape. Cold rain did push some coho up into the river. Anglers are floating fresh spawn, fly fishing with egg patterns or floating a jig and wax worm. Ludington: No boats have been out. Pier anglers and those surfcasting are catching some steelhead. Fresh spawn worked best. Pere Marquette River: While the salmon run is winding down, anglers are still catching the occasional coho. Steelhead are moving in on a daily basis. Some nice brown trout were caught. Pentwater: Pier anglers are catching coho when still-fishing with spawn. Steelhead should also be in but none were caught yet. Anglers are reminded that it is unlawful to take fish for the sole purpose of removing the eggs. Marquette: Catch rates varied as boat anglers caught mainly coho and lake trout. Those targeting the breakwalls in the Lower Harbor had no success. The lake trout out further in the lake are close to spawning so catch rates should pick up with the onset of colder weather. Dead River: Had no chinook to report but anglers did catch a few coho. Carp River: Shore anglers reported fair catch rates for coho near the mouth. The coho run has peaked. Anglers are using spinners or floating spawn bags. Chocolay River: The coho are spawning so catch rates have slowed. Try spinners, stick baits or spawn bags. Menominee: Those trolling off the Cedar River in 12 to 30 feet caught a few walleye after dark. Those fishing the Cedar River caught smallmouth bass when casting crank baits. Those targeting trout were casting spinners or floating spawn bags up near the first rapids, but no fish were caught. Menominee River: Anglers are fishing just below the Hattie Street Dam on both the Michigan and Wisconsin side. Salmon were still being caught but the bite has slowed. Some nice yellow perch have been caught between the mouth and Stephenson Island. Boat and shore anglers are drifting or still-fishing with minnows or crawlers. Walleye and smallmouth bass were caught early or late. Little Bay De Noc: Has lots of perch anglers. Catch rates ranged from fair to excellent. Most were fishing north of the "Narrows" or between the Kipling Flats and the Day's River with minnows or crawlers in 10 to 24 feet. Catch rates were better in shallower waters. Some caught the incidental northern pike. Big Bay De Noc: Has plenty of smallmouth bass anglers. They are fishing minnows 15 to 30 feet down out near Snake Island or 14 to 24 feet off Ansell's Point. Some were also looking for perch but very few were caught. Munising: Boat anglers have decreased as those targeting coho were lucky to get one fish. It appears the late arriving fish will most likely be caught while staging off the Anna River. Pier anglers caught coho and splake. Coho were caught by those casting or floating spawn bags. Splake were caught primarily on spawn. The salmon are running smaller this year. They range 2 to 3 pounds. Grand Marais: Those trolling for trout and salmon had poor results. Pier fishing was slow. Shore anglers had little success when casting spoons or floating spawn. St. Mary's River: Anglers fishing the east side of Lime Island caught walleye when trolling crank baits in 12 to 18 feet. In Munuscong Bay, those jigging dark green or brown tube jigs in 4 to 8 feet caught smallmouth bass over the rock piles near Moon Island. DeTour: Had poor weather and low angler pressure. Drummond Island: Those able to get out did catch a few perch in 8 to 11 feet in Scotts Bay and in 12 to 14 feet on the south end of Ashman Island or the west side of Rutland Island. Try crank baits off the bottom with spreaders and shiners. A couple walleye were caught on the northwest side of Peck Island by those trolling medium size crank baits in chrome or fire-tiger. Rattle traps also caught fish. Cedarville and Hessel: The weather has been poor. There are no bass or pike anglers, and the perch are not hitting in the bays. Carp River: Anglers are targeting steelhead but none were caught. Tip of the week: Help feed the hungry with a monetary gift or by donating venison through a participating processor. Learn more about Sportsmen Against Hunger.